Testing Equipments, Fabric Testing Equipments, Carpet Testing Equipments, Yarn Testing Equipments, Rubber Testing Equipments, Paper Testing Equipments, Paper Board Testing Equipments, Carton Testing Equipments, Plastic Pipe Testing Equipments, PVC Pipe Testing equipments, Leather Testing Equipments, Footwear Testing Equipments, Coated Fabric Testing equipments, Foam Testing Equipments, Conduit Appliance Testing Equipments, Electrical Appliance Testing Equipments, General Lab Equipments, Metal Testing Equipments, Plywood Testing Equipments, Laminates Testing Equipments, Automobile Testing Equipments, Paint Testing Equipments, Bursting strength Testers, Conditioning Chambers, Din Abrasion Testers, Indentation Hardness Testers, Univeresal Testing Machines, Salt Spray Chambers, Hot Air Oven, Tensile Strength Testers, Digital Box Compression Tester,Plastic Testing Equipments, Metal Testing Machines, Wood Testing Equipments, Automobile Testing Machines as an active Manufacturer, Supplier, Dealer, Distributor, Trader and Seller etc. (*Importer/Exporter/Service Provider). 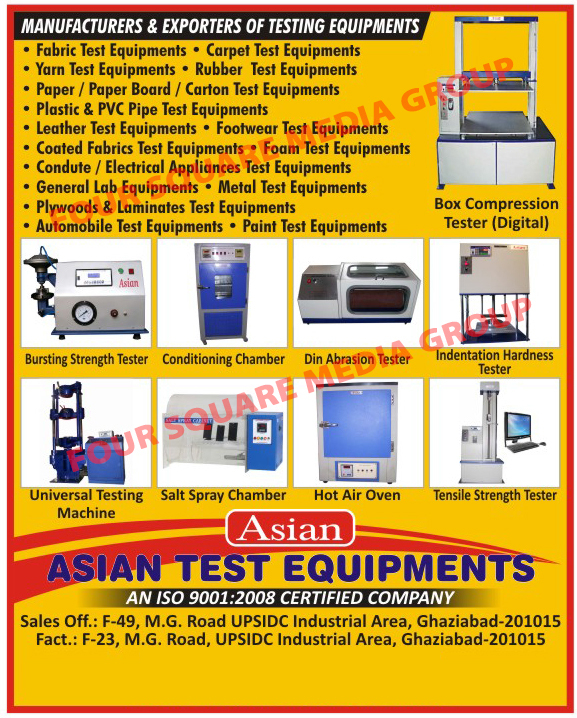 Address- Head Office: F-49, MG Road, UPSIDC Industrial Area Ghaziabad 201015 U.P.